What is needed is a recognition that economic growth is no longer possible or even desirable, and to work from there. Europe can, and should, lead the way in changing to a more sustainable economic system; a system that puts employment and the environment before profit and material wealth. It is clearly absurd for politicians and economists to keep going on about a return to growth, becoming more competitive and raising productivity yet further, as if such things could go on forever, even as the dole lines keep growing. Those days are gone, and the sooner we accept it the better. 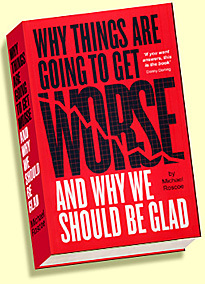 For Europe in particular, prolonged recession – the end of growth – seems inevitable. There is no new industry to kick-start the growth process, no major oil finds or new technology boom, as helped during the 1970s to 90s, and of course there’s no chance of repeating the credit-fuelled construction and consumer spending spree of the last decade. It had to happen sometime; as I pointed out at the beginning of this book, continuous economic growth is ultimately impossible, as well as being ecologically undesirable. And perhaps it isn’t surprising that Europe, the first developed region of the modern world, should be the first to experience decline. Europe is showing the symptoms of a malaise that one might expect of an advanced economy that has reached the limits of growth, with many of its natural resources close to depletion, falling industrial output, rising unemployment, declining populations in many nations, and of course the huge build-up of debt. One might argue that European nations aren’t the first to experience these problems, that Japan has been in a similar situation for a decade or more. This is perhaps true, but Japan is a bit different; one stalled economy in a generally buoyant region. And Japan has managed to avoid the real killer of high unemployment, partly because it still has a strong manufacturing base with a large export market. In this respect Japan is more representative of Germany than of the rest of Europe. It does, however, provide some interesting clues as to what Europe can expect in the near future. 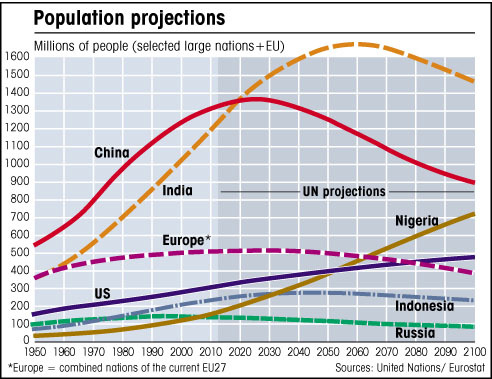 A decline in population is a good thing in terms of a sustainable future, but it raises questions with regard to the strength of the economy. How will a smaller workforce provide for an ageing population? Will there be enough workers and enough real wealth production to fund pensions, healthcare and other future government obligations? It is almost certainly the case that there won’t be, at least not while expectations are based on the boom years of the last half-century. However, if expectations are lowered until they meet with reality, prospects don’t have to be as bad as they might look right now. 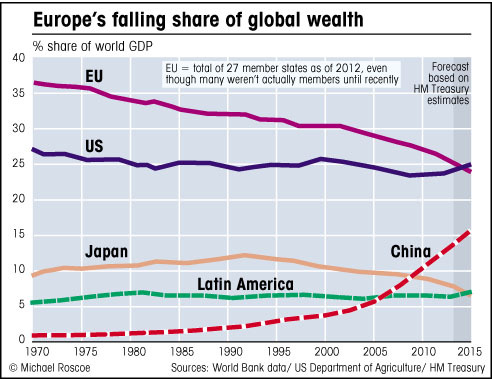 Europe must now face up to the reality of a decline in growth and material wealth. Working together through the EU, the nations of Europe must show the way forward into a brave new world, throwing out the old economic models that worked only briefly in the post-war boom years, and focussing instead on creating real jobs in what will be the industries of the future; renewable energy, environmentally-sound construction and transport and, in particular, sustainable agriculture. The EU should stop following the failed Anglo-saxon model of unbridled finance-based capitalism, stop trying to compete with other regions in areas where it can’t win anyway, and show that future generations need not necessarily be much poorer just because economies will cease to grow in GDP terms. If the EU’s leaders can get their act together, they can show the rest of the world that there’s a better way into the future than trying to grow indefinitely and make money from money, both of which are ultimately impossible anyway. These tough times present Europe with an opportunity for radical change; a new economic order and a different kind of prosperity, based on social justice and real work, rather than competition, greed and debt – a model that will lead to a better, more equal world.